This amazing photograph probably dates to 1900. 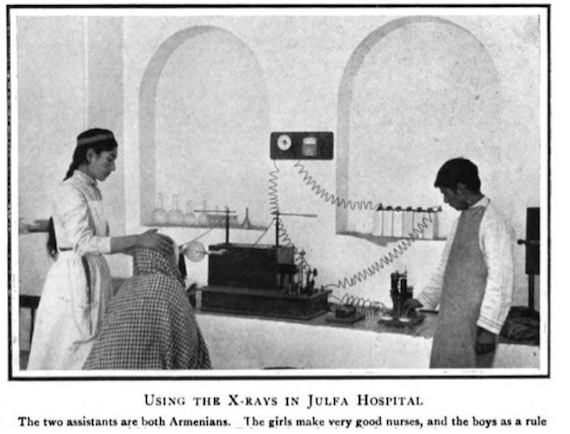 Taken in at the Christian Mission Society hospital in Julfa, the Armenian neighborhood of Isfahan, it shows a nurse taking an x-ray of a patient. The use of x-ray technology was still relatively new even in the US and Europe, and that the medical missionaries transferred it so quickly (perhaps with the aid of Armenian physicians) to Iran struck me as remarkable. It was taken by a British medical missionary.